If you plan to insulate your soil with mulch before the seasons change, first learn which type of material best meets your needs. 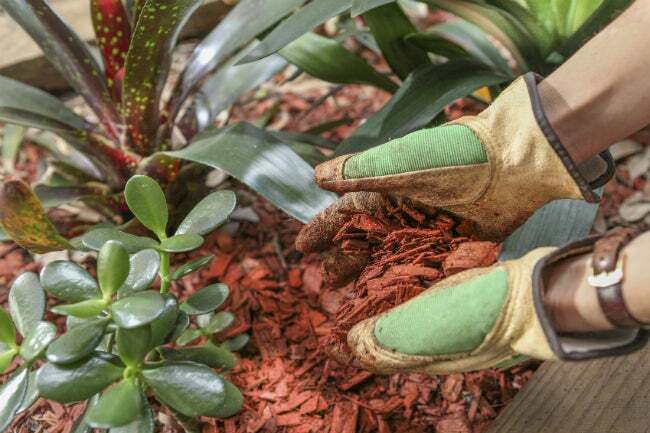 Mulch may not be a miracle cure for all that ails your garden, but according to professional gardeners and arborists, it certainly comes close! A wide variety of materials fall under the heading of mulch, but they all share one basic purpose: improving soil conditions. Among its long list of benefits, mulch insulates the soil from temperature extremes, locks in moisture, keeps weeds at bay, prevents soil compaction, and protects sensitive plantings from damage by weed whackers and lawn mowers. Plus, virtually all types of mulch can give planting beds an attractive, manicured, and well-maintained appearance. Broadly speaking, homeowners select from two basic types of mulch: organic and inorganic. Organic mulches—hardwood and softwood chips, bark, evergreen needles, leaves, grass clippings, compost mixes, newspaper and cardboard, and a variety of other plant byproducts—consist of materials that decompose over time. Work any of these into the soil and they can improve soil fertility, aeration, structure, and drainage as they decompose. Because organic mulches decompose, they must be replenished on a regular basis, but most landscape professionals prefer organic mulches because of the many benefits they bring to the soil. Inorganic mulches, on the other hand, include various types of materials that do not decompose and therefore do not need to be replenished very often, if ever. 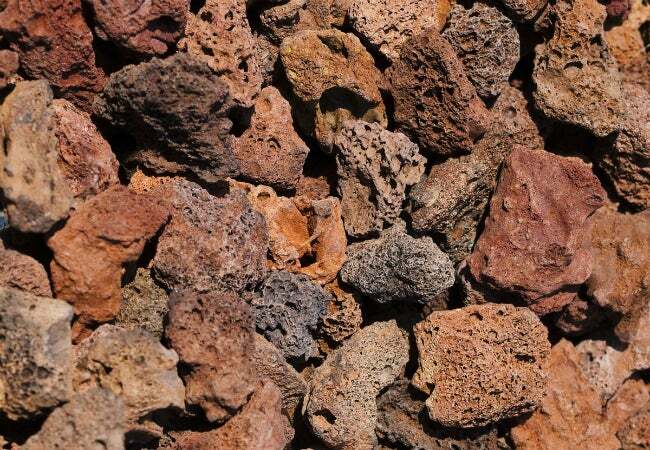 These options include rock, stone, lava rock, crusher dust, pulverized rubber, landscape fabrics, and other man-made materials. 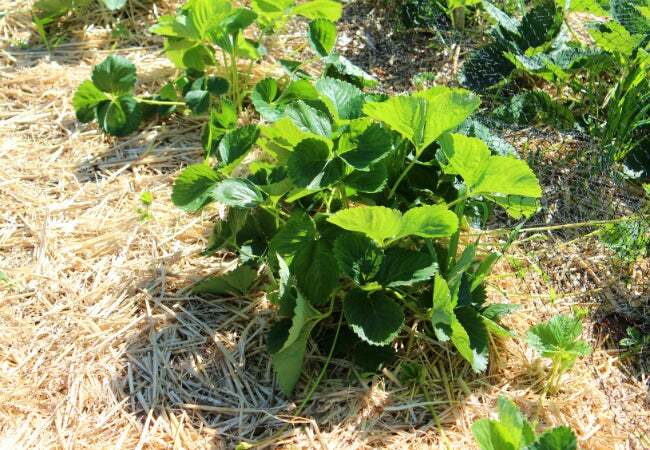 Inorganic mulches are ideal for decorative use and controlling weeds. Because rocks and stones absorb and reflect heat, they have the advantage of warming the soil for early spring planting of fruits and vegetables, but can be detrimental to plants during periods of hot, dry weather. When you’ve decided you’re ready to start reaping the many benefits of mulch, you’re not limited to just the standard by-the-bag chips from your local home improvement center—you’ve got options! Homeowners have access to a wide range of mulch types. Select one that best suits your landscaping project based on its local availability, cost, appearance, quality, and durability. Here are some of the types of mulch that should be on your radar. Both hardwood and softwood bark, chips, and nuggets—byproducts of the lumber and paper industries—are typically aged and dried, and sometimes even dyed red or black, then sold in bags. Hardwood works best around trees, shrubs, and in perennial beds, while softwood (typically made from pine) should be reserved for use around large trees and shrubs. Pine tends to be slightly more acidic and therefore takes longer to decompose than other organic mulches. Check with your local municipality before you head to the home improvement center; many offer freshly ground tree mulch to homeowners at no charge. This fresh material is neither dried or aged, so use it only for walkways, as it leaches large amounts of nitrogen from the soil as it decomposes. Clean wheat, barley, or oat straw is ideal for lightly mulching newly seeded lawns. The straw mulch keeps the grass seed from washing away, deters feeding birds and rodents, and, until it decomposes, conserves the moisture the seeds need for good germination. When you’re shopping for mulch, don’t confuse straw with hay. You should avoid the latter, which contains seeds that could sprout up as weeds in your garden. 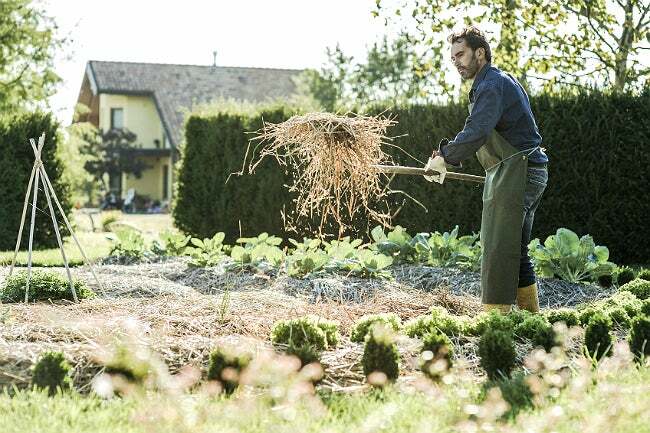 No need to shop around—you can make your own organic mulch using nothing more than grass clippings or shredded leaves. Leaf mulch is ideal for use in garden beds and around trees and shrubs, while grass clippings may be spread in thin layers across vegetable and perennial beds and then turned into the soil at the end of the growing season. Be careful not to apply in thick layers, or else the material will mat. Also, don’t save the clippings from lawns that have been treated with herbicides or insecticides. Shredded black-and-white newspaper or undyed natural cardboard can be used as an effective weed suppressant. 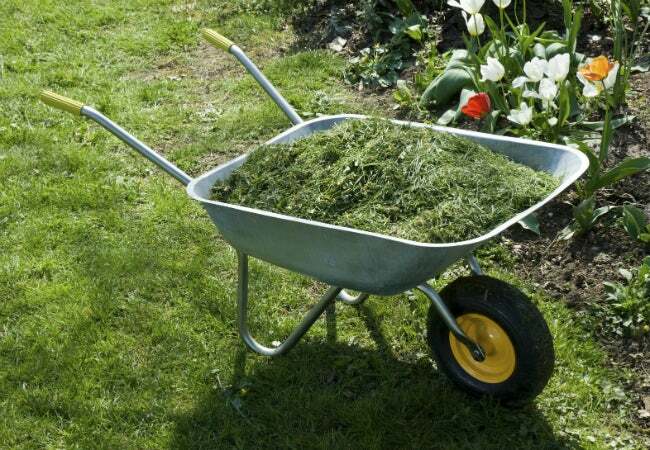 Apply two to three layers at a time, then cover with another heavier organic material, such as leaves or grass clippings, to hold the lightweight mulch in place. Take care not to mix in colored newspaper or coated cardboard; these do not decompose readily and may even expose your garden to toxic dyes. Popular for their rich color and pleasant scent, cocoa bean hulls are lightweight, easy to handle, and appropriate for all planting areas. Don’t apply more than one inch or water excessively, because cocoa chips already decompose quickly—and since they’re a pricier option, you won’t want to have to do more than an annual application. 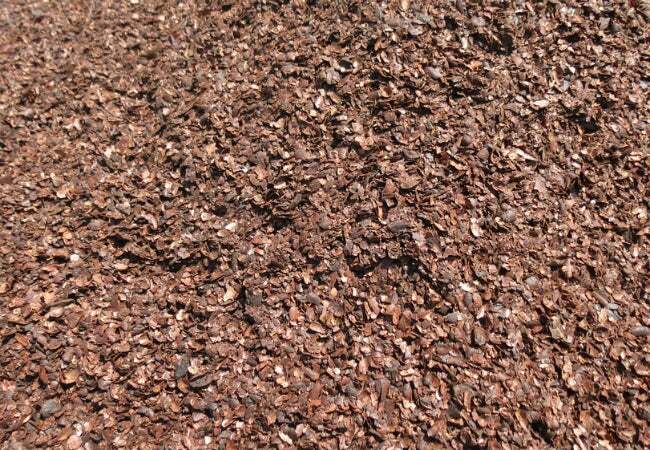 If you have pets or wildlife, you should avoid cocoa mulch, as chocolate and its byproducts can be fatal to animals if consumed. Nothing beats well-composted, nutrient-rich animal manure when it comes to mulch for vegetables. 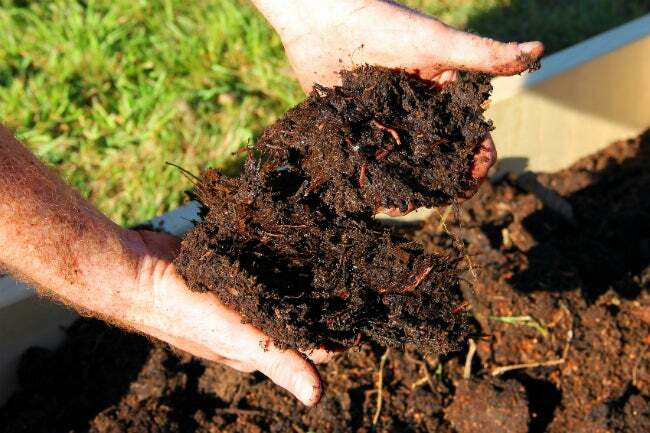 Two words of caution, however, before you add this type of mulch to your garden bed: Fresh manure burns plant roots, and dog, cat, and pig manure can harbor disease-causing organisms—avoid all of the above! Lava rock, crushed gravel or crusher dust, marble chips, and pea gravel will not break down, making them a popular option for walks and pathways, thanks to their one-time investment of cost and labor. Avoid using stones around trees, shrubs, and other plants, however, because they won’t effectively retain moisture and can cause heat stress on plants through reflection as well as ground heating, which can burn roots. Plastic polyethylene film is impermeable, which means that water and other nutrients cannot pass through. While this quality makes it ideal as a short-term weed killer, plastic is not suitable for long-term use. If you employ it to warm the soil around fruit and vegetable plants, you’ll have to install an irrigation system under the plastic, or water your plants by hand to make sure they get adequate moisture. 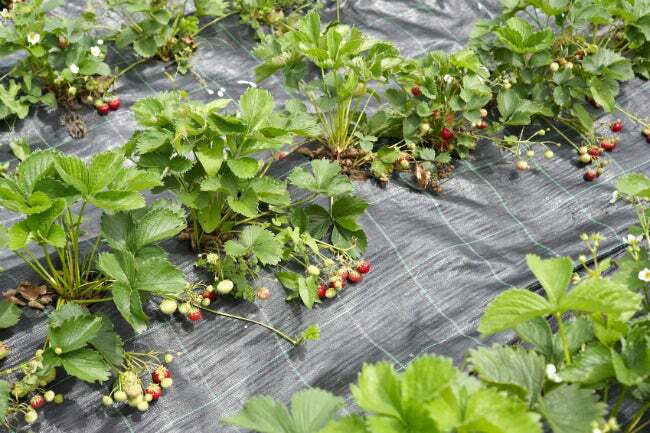 Remove the plastic at the end of the growing season to keep it from deteriorating in the sunlight, and then replace it the following year. Landscape fabric is a better choice for long-term use, as it suppresses weeds but also allows air and water to pass through; however, it is a more expensive material. 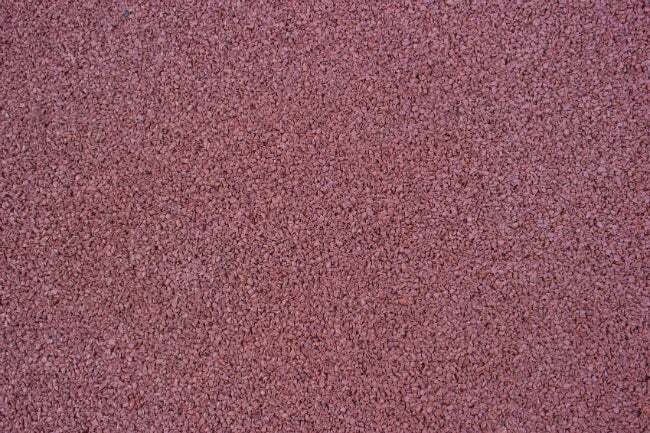 Landscape fabric is best used with a layer of organic mulch, such as wood chips, on top. Rubber mulch—manufactured from recycled, pulverized tires—is inexpensive and highly durable, which makes it perfect for high-traffic areas, such as playgrounds. Leave it out of your home landscaping projects, though; rubber mulch does not decompose, and some studies indicate that toxins found in the rubber can actually leach into the soil. Beginner mulchers, beware: There can be too much of a good thing. Over-mulching, especially erecting “mulch volcanoes” around the bases of trees and shrubs, can lead to problems with insect and rodent infestation. Plus, mulch that is too deep can cause a buildup of excess moisture in the root zone, which can stress the plant and lead to root rot. Most professionals recommend limiting your layer of mulch to a depth of between two and four inches.